The dogs in our Therapy Troupe travel to different locations where they can provide emotional support! Our Junior Training Program is a youth group course that incorporates emotional support dogs to provide an environment devoted to promoting self-esteem and social skills! The Therapy Troupe Program is a traveling group that visits community centers in order to reach out to those who need emotional support! 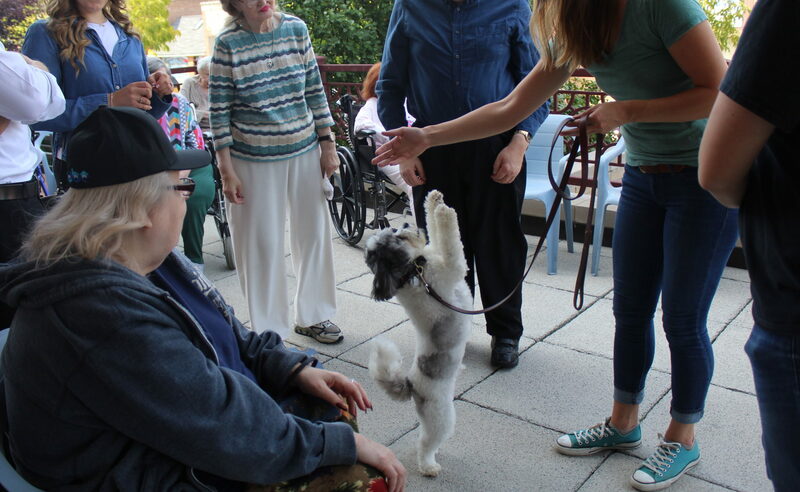 The dogs in our therapy troupe are highly trained and ready to entertain (and cuddle!) any new friend they meet! If you would like to request to be visited by our therapy troupe and join in on the fun, please contact us! During our the Junior Trainer Progam the junior trainers are working with the dogs on skills such as basic obedience, leash handling, agility, certain tasks, and fun tricks! The goals of the Junior Trainer Program! Facilitate an accepting and uplifting environment which nurtures emotional progress in the handlers and dogs participating in the group class. Creating learning experiences by which handlers are presented with a specific skill to improve upon with the dog; hopefully encouraging the handler to derive confidence from their ability to communicate with the dog. Demonstrate and practice proper dog handling skills using leash, hand, and vocal cues, thereby teaching the handlers multiple ways to communicate with the dogs. Keep handlers and dogs engaged in learning by presenting challenges proportionate to each individual dog/handler team’s skills. Create a positive experience for the dogs in working with new individuals via the use of food, proper praise, toys, and other experiences viewed as a reward to the dog. Create a sense of purpose in the handlers by updating them regularly on each dog’s progress and positive outcomes of their influence on the dogs.